Międzynarodowy festiwal chórów młodzieżowych i dziecięcych "Iuventus In Praga Cantat"
Eurocarnival and the Festival of Guggemusic Ensembles is coming back to Prague after a big success in 2006 and 2010! After 8 years Guggemusic ensembles and Narrengruppen, carnival groups with masks typical for German speaking countries, and beautiful costume dance groups of Venezian style will visit our capital. The carnival takes place in a different European city every year. Last years of the festival were held e.g. in Paris, Rome, Berlin, Salzburg, Verona or Venice. The Eurocarnival has been held in Prague for the third time with a participation of nearly 1300 musicians, dancers, fools and jokers from Germany, Switzerland, Austria, Liechtenstein and Italy. 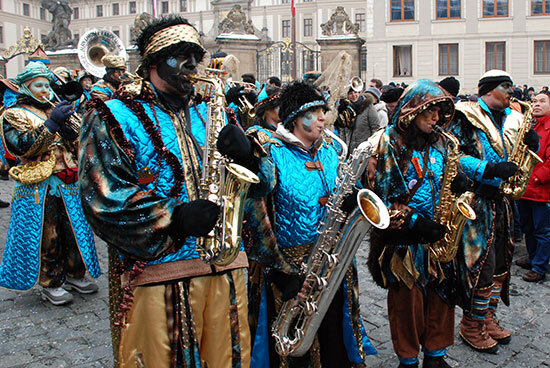 Prague´s citizens as well as visitors will have a great opportunity to admire a variety of beautiful and often peculiar costumes and dance in carnival rhythm to funny and original music. Although it is a Central European carnival taking place in winter time, it equals South American carnivals with its liveliness and energy. Carnival parade through the Coronation Road (road which every Czech king had to go through before a coronation in the St. Vitus Cathedral) – the most beautiful and romantic scenery for a parade! route: Hradchin Square, Nerudova Street, Malostranske Square, Charles Bridge, Old Town Square. The highlight and closing event of the parade will be a mass concert of all participating ensembles where the world-famous Czech polka „Roll out the Barell“ (Rosamunde, Skoda lasky) will be played.